The Answer is Something Amazing. God gave you a unique set of gifts. Now, He is giving you the opportunity to use them. What could be more amazing than that? Maybe you haven’t discovered your true gifts yet, or you aren’t sure how God is calling you to use them. That’s OK – at Lancaster Bible College, we support and advise you as you discern and clarify God’s calling. Perhaps God has already set you on a clear path, and you’re looking to deepen your knowledge and sharpen your skills. That’s great, too – we’re here to encourage, support, and strengthen you in your vocation and in your faith. 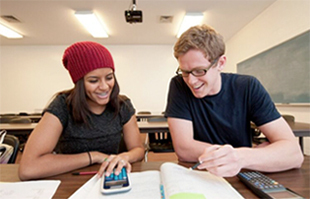 Academic Programs: Learn more about our exciting degrees programs. Admission Requirements: Useful information about steps you’ll need to take before applying. Ask a QuestionGet your response by email, phone or text. Young adults seeking the traditional college experience, living on-campus or commuting. Choose from 25 majors offered by 7 academic departments. Participate in organized student groups and our 13 athletics programs. Experience internships and study abroad. Working adults can earn a college degree in a way that fits their schedule. Complete a certificate, associate’s degree, or bachelor’s degree 100% online, entirely in the classroom, or a mixture of both. Complete one course at a time, to earn your degree in less time. Capital Seminary and Graduate School is the graduate division of LBC. Earn a graduate certificate, MA, MEd, MDiv, DMin, or PhD. You can complete your degree using a blend of both online and in-class learning, so there’s no need to relocate to earn your degree. At LBC, the purpose of a biblical education is not to transmit information to you but to transform your life. While knowing more things may be good for you, learning to think and live with a biblical worldview is what really makes a difference in your life and in the world. God’s Word is woven into everything we do at LBC. Whether you’re learning about theology or working on a group project on business administration, our high regard of Scripture is “baked-in” to everything we do. When students graduate from Lancaster Bible College, they leave with a clearer sense of God’s direction for their lives and are equipped to live out that calling. How do we do it? What’s our secret? Our secret is no secret – it’s in our name. Prayerfully spending time with the Bible allows God to reveal himself and His will to us. So that’s what we do here. As our professors and advisers teach you the knowledge and skills you need, they also guide you in seeking God through studying His Word. We really do believe that the Word of the Lord endures forever (1 Pet. 1:25). Scripture has the power to speak into our lives and change us for the better. You don’t have to go to college to read the Bible, of course. So what makes studying the Bible at Lancaster Bible College special? What does the Bible say about not only God, but also about the people you encounter in your life? What does the Bible teach us about the nature of knowledge? What can we learn from the Bible about right and wrong? When we wonder what the future holds, what does the Bible tell us? We don’t address those questions from the comfort of a tidy ivory tower. We address them in the context of our lives, the world today, and our studies. An education from Lancaster Bible College is built upon the foundation of the God’s Word, with all its power to transform our minds, our hearts, and our lives. At Lancaster Bible College, we educate students to think and live a Christian worldview, but it doesn’t end there. Our mission is also for LBC students and graduates to proclaim Christ in the world by serving Him in the Church and society. You will find LBC graduates all over the world – in churches, mission organizations, nonprofits, businesses, schools, communities, and homes. If you’re interested in a college that exists to help believers like you develop and use your God-given gifts, we invite you to connect with a member of our admissions team to learn more about Lancaster Bible College. We can answer your questions, arrange a visit, or give you an overview of LBC’s online offerings. Call us at 717.569.7071 or click below to continue browsing this website.